Lexington, Ky. – US Equestrian is excited to announce the launch of the Para-Equestrian Dressage Coach Certification Program developed by Michel Assouline, USEF Para-Equestrian Dressage Technical Advisor and Head of Coach Development. This is a first of its kind coaching program for the industry in the U.S. The certificate program comprises of four levels: master coach, silver coach, bronze coach, and apprentice coach. In 2018, US Equestrian launched the pilot program, which played a role in the medal count for members of the U.S. Para-Equestrian Dressage Team presented by Deloitte at the FEI World Equestrian Games™ Tryon 2018. The curriculum covers the principles of para-dressage coaching, including guided improvement process, coaching philosophy, and sport-specific skill acquisition. Moreover, it increases a coach’s ability to prepare athletes from grassroots education to international competitions, through progression of the certificate levels. With its goal of coach development, the program uses classroom lecture time as well as simulated lessons to give coaches information and feedback on their teaching, knowledge, and overall performance. Additionally, the program involves onsite practicums, self-study, online exams, and final assessments. The certificate program takes three to six months to complete, with a fast-track program available to qualifying coaches. Currently, 31 participants from the pilot program aim to be fast-tracked in 2019. US Equestrian would like to thank the U.S. Department of Veterans Affairs for providing the Federal Adaptive Sport Grant, which has helped make the coach certificate program possible. This initiative has been conducted in partnership with the Professional Association of Therapeutic Horsemanship with a goal of increasing awareness and coach education opportunities within Paralympic equestrian sports and to aid in the development of a US Equestrian coach database to support the competition pipeline for para-eligible athletes. For more information about the application process and certification levels, view the information booklet or contact Laureen Johnson at lkjohnson@usef.org. This entry was posted in FEI & USEF Dressage News, News and Announcements on January 16, 2019 by ludlumfarms. This entry was posted in FEI & USEF Dressage News, News and Announcements, South Florida News on January 16, 2019 by ludlumfarms. 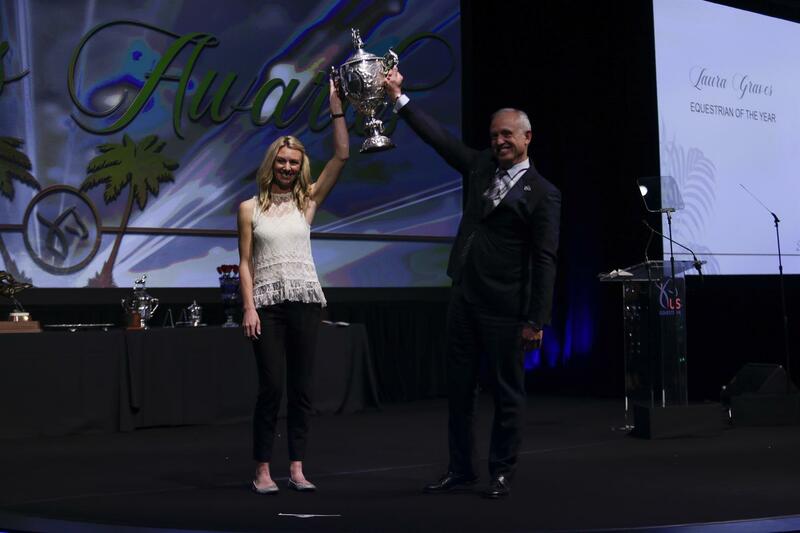 West Palm Beach, Fla. – Laura Graves (Geneva, Fla.) has been awarded the Robert P. Strub Trophy as the 2018 USEF Equestrian of the Year at the Pegasus Awards presented by Adequan® during the US Equestrian Annual Meeting. Graves has been a valuable member of The Dutta Corp. U.S. Dressage Team for many years and her numerous contributions to the sport of dressage on the international stage and at home in the U.S. make her an impressive force in the sport of dressage. This entry was posted in FEI & USEF Dressage News on January 16, 2019 by ludlumfarms. In 2018, US Equestrian announced an intent for a partnership between the USEF laboratory and the University of Kentucky, and they aim to finalize this agreement in 2019. The US Equestrian rule and hearing process remains complex for many members. As a result, they will work on education outlining how the process works in an effort to increase transparency. In an effort to reduce costs to US Equestrian members, David Harris, Chief Financial Officer, stated that they want to simplify financial reporting and automate post-competition reports. In addition, the Finance Department is working to implement paperless credit card transactions, an automatic member call-back service, and a telephonic membership renewal process for the US Equestrian Customer Care Department. Moroney spoke highly of the improvements made thus far by the Licensed Officials Department. Increased functionality of internal processes, a new online application system, a new clinic info request system with affiliates, and clinic calendar promotions are the top aims in 2019. Protecting horse welfare and ensuring fairness across the sport guides the Drugs and Medications Department each day. Keating mentioned enhancing sample collection training for veterinarians and educating athletes on sample collection and supplement research. In line with the organization’s automation goal, the department will work on implementing an online-only filing of Medication Report Forms. Moroney described the updated focus of the Compliance Department in 2019. Hiring a new director, increasing venue evaluations, conducting town halls and forums, educating others on the compliance program, and working with affiliates to develop and refine competition standards are on the table. Moroney hopes to remedy affiliate status issues by having open discussions and working together. Developing clear recognized affiliate status requirements, completing affiliate agreements, and establishing regular progress meetings are on Moroney’s radar in 2019 and beyond. Building a strong staff and volunteer team is important for continued success. Moroney noted that training, developing employee processes, implementing recommendations of human resource assessments, and incorporating predictive index assessments in hiring and team-building will be focuses for the future. Moroney closed out the General Session by commending Kessler for his Strategic Plan and its flexibility in allowing the organization to meet the initiatives. “It is an exciting time for equestrian sport,” Moroney said. “As I said earlier, we have some challenges, but out of those challenges always comes the opportunity to be better, to improve, to grow, to elaborate, and to partner on things. That has always been my philosophy in life, and I think it is a philosophy of the organization.” Learning from experience and the input of members has set up a bright path for US Equestrian in the year ahead. 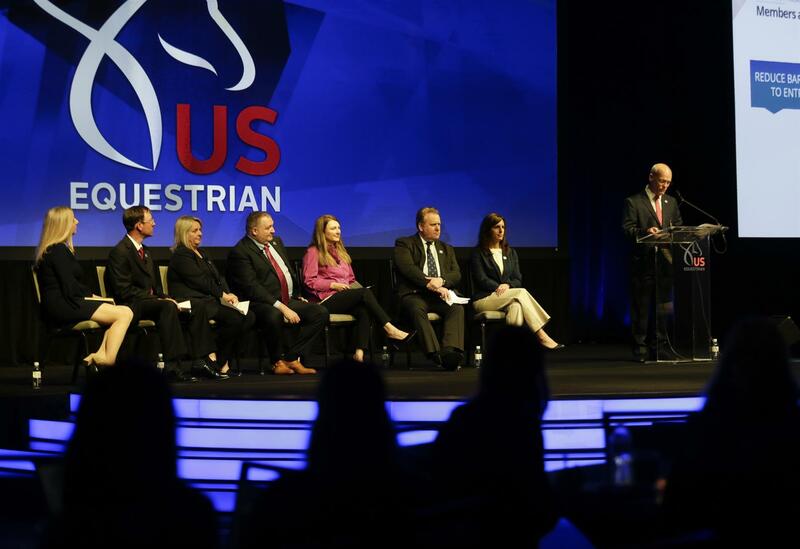 View the senior staff presentation on usef.org and watch the on demand video on USEF Network. Dressage Calendar for South Florida Show Season 2019! CLICK HERE FOR UPCOMING DRESSAGE EVENTS! This entry was posted in Education, FEI & USEF Dressage News, News and Announcements, South Florida News on November 27, 2018 by ludlumfarms. It would be an understatement to say that Nora Batchelder of Williston, Fla. had a successful trip to the 2018 US Dressage Finals presented by Adequan®, held November 8-11 in Lexington, Ky. Going into the final day of competition on Sunday, her two talented small tour horses, Faro SQF and Fifi MLW, had already earned top placings in both the Intermediate I Open and Intermediate I Open Freestyle divisions. The only problem was that Faro SQF always seemed to come out on top. But in the Prix St. Georges Open Championship, the nine-year-old Hanoverian mare (Fidertanz x Wolkenstanza MLW by Wolkentanz I, bred in the U.S. by Mary Winn) finally turned the tables on her stablemate, setting a score of 73.137% which neither Faro SQF, nor anyone else, could beat. In the winner’s circle, Batchelder and Fifi MLW were presented with both the Miki Christophersen Perpetual Trophy (presented by USDF Region 4) for their victory and the Lloyd Landkamer Perpetual Trophy for FEI Highest Scoring Mare (presented by Janet Foy), an honor which Fifi MLW also earned in 2017. After earning a Reserve Championship in Saturday’s Second Level Adult Amateur Freestyle division, Region 8’s Alexandra Krossen of Basking Ridge, N.J. and the six-year-old Oldenburg mare Nicene (Nimbus x Pamela by Portofino, owned and bred in the U.S. by Heather Mason) improved upon that performance to win the First Level Adult Amateur Freestyle Championship with 72.700%. Martin Kuhn of New Berlin, Ill. (qualified in Region 4) and Debra Klamen’s five-year-old Hanoverian gelding Ronin (Romanov Blue Hor x Something Royal by Sir Donnerhall I, bred in the U.S. by Marcia Boeing) have proven to be a winning combination: the pair claimed top honors in the Training Level Open division on Friday, and returned to the ring to earn a top score of 77.844% and win the First Level Open Freestyle Championship. After having to resort to improvisation with another mount in a previous day’s freestyle, Kuhn was pleased just to stay on track with Ronin. Elizabeth Cronin’s Venivici (Vitalis x Sabrina by Sherlock Holmes) definitely lived up to his name as the seven-year-old Westfalen gelding not only came to the Finals, but conquered. In the experienced hands of Martin Kuhn of New Berlin, Ill. (representing Region 4), Venivici added to his 2018 awards roster by winning the Second Level Open Championship with 72.602% for Kuhn’s second win of the day. But that doesn’t mean it was easy. The Fourth Level divisions at this year’s US Dressage Finals proved to be hard-fought all week, but ultimately the top two finishers from Saturday’s Fourth Level Open class repeated their success on the final day’s Fourth Level Open Freestyle Championship. Heather McCarthy of Prairie Grove, Ill. (Region 4) once again rode Sandi Chohany’s seven-year-old Oldenburg gelding Au Revoir (Ampere x Lara by Liberty M) to victory on the strength of a score of 71.167%. Hannah Hewitt of Atlanta, Ga. (Region 3) has certainly made the most of her very first trip to the US Dressage Finals. After proving to be unbeatable in the Intermediate I and Freestyle divisions for Adult Amateurs earlier in the week, Hewitt returned to the Alltech Arena one last time with Tammy Pearson’s eight-year-old Dutch Warmblood gelding Fidens (Tango x Bliss by United) to accept the Janine Westmoreland Malone Perpetual Trophy (presented by USDF) for their victory in the Prix St. Georges Adult Amateur Championship with 70.735%. This entry was posted in FEI & USEF Dressage News, News and Announcements on November 16, 2018 by ludlumfarms.